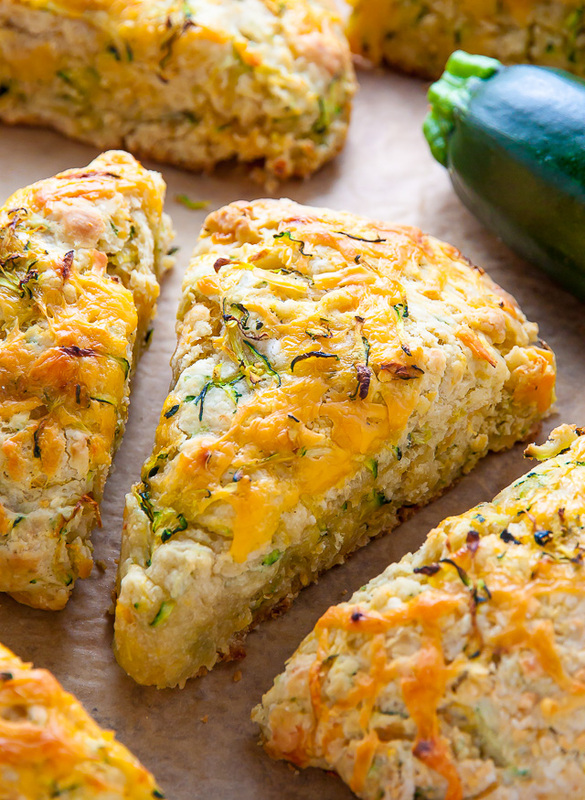 My favorite savory scones are loaded with sharp cheddar cheese and fresh zucchini! Who knew veggies could taste this good!? 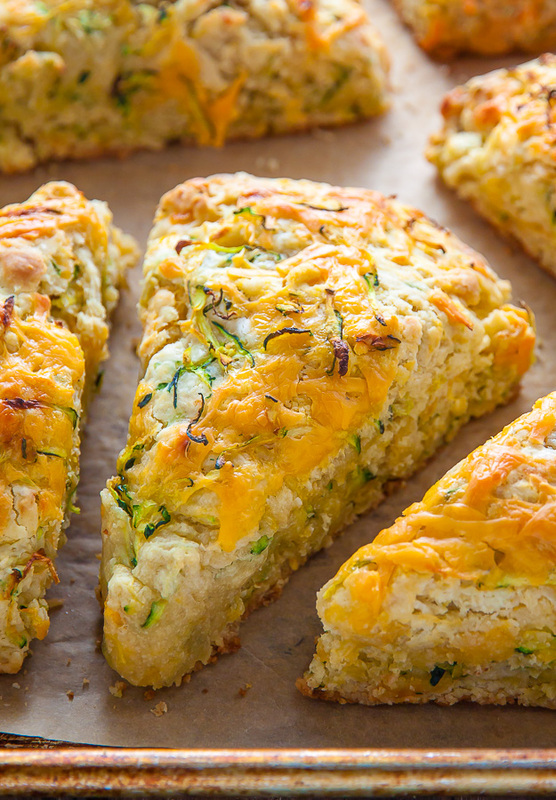 If you have leftover zucchini, try these zucchini cheddar scones! 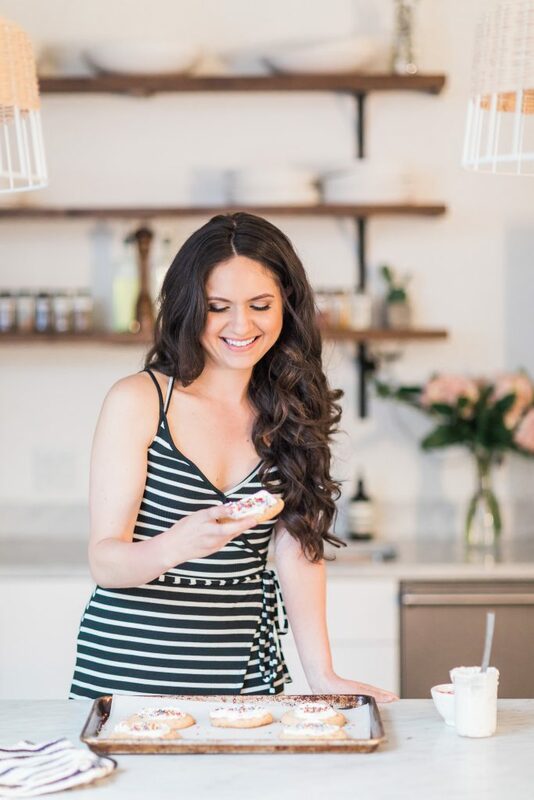 When I don’t know what to make for dinner – or don’t feel like cooking dinner at all – I often opt to make breakfast instead. Pull a few scones from the freezer, fry a couple of eggs, add few slices of avocado and viola – a meal is born! Anyone else a fan of the almighty breakfast for dinner scenario? It’s a BBN favorite. Last week I reached into the freezer to grab a few ham and cheese scones (have you tried them yet?) and – much to my hungry/hangry horror – realized they were ALL gone. Worst moment of my week! ← Kidding. 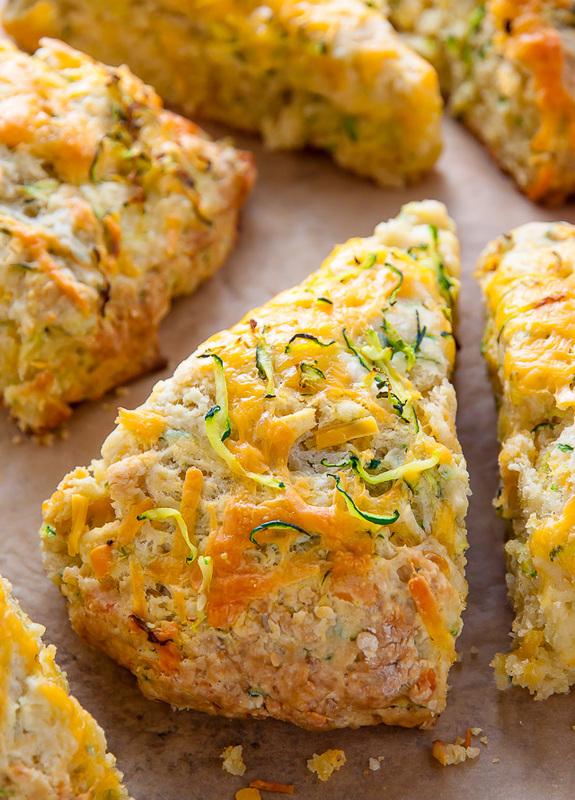 I’m a “make lemonade out of lemons” kind of girl, so after a little digging in the fridge and some creative head scratching, these Zucchini Cheddar Scones were created. The results? 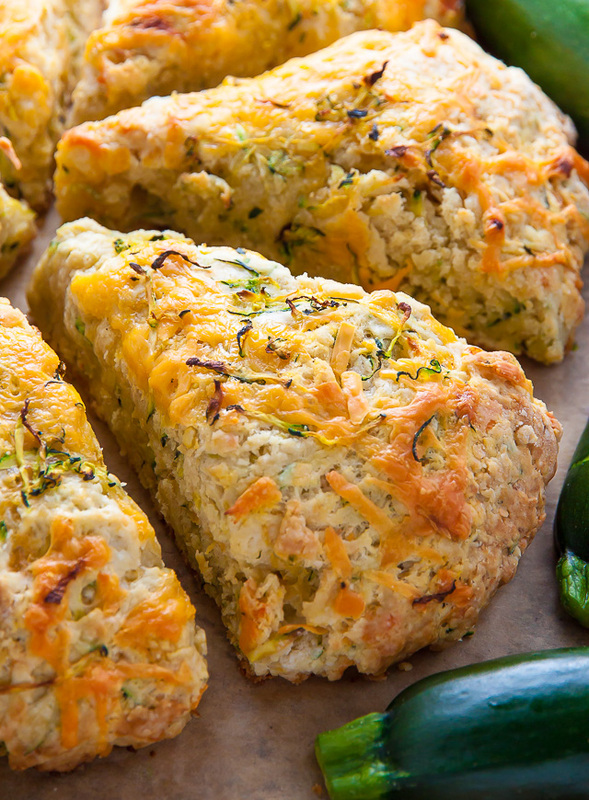 Cheesy, flaky, buttery goodness… and the zucchini makes them so moist! Can you tell I’m a girl in love? After one bite, I think know you’ll be a fan, too. Let’s talk about zucchini for a minute! For this recipe you’re going to want to grate the zucchini (coarsely) then drain the heck out of it. I’m serious! Zucchini is loaded with moisture, so you’ll want to squeeze as much of that moisture out before adding it to the scone batter. If you skip this step your scones will be sad and soggy and I don’t want that to happen to you! To efficiently drain your zucchini simply place it in a fine-mesh strainer and let it sit for about 10 minutes, then press as much moisture out as you can by hand; you can also wrap the shredded zucchini in a piece of cheesecloth (or a clean hand towel) and squeeze the moisture out. Both ways work just fine, so it’s really just a matter of what tools you have on hand. Make sure your butter is extremely cold before beginning. I’ve said it before and I’ll say it again: the key to tender, flaky, bakery style scones is COLD BUTTER. When it’s time to incorporate the butter into the dough, you should resist working with your hands if possible, since body heat will quickly melt the butter. Instead, use a pastry cutter or two forks. My favorite method is grating the butter into the dry ingredients, then quickly working it into the dough with two forks. If you find your dough is warm and/or sticky, pop it back into the fridge or freezer for a few minutes and let it chill, then get back to work. My favorite savory scone recipe loaded with sharp cheddar cheese and shredded zucchini! Who knew veggies could taste this good!? Preheat oven to 400°(F). 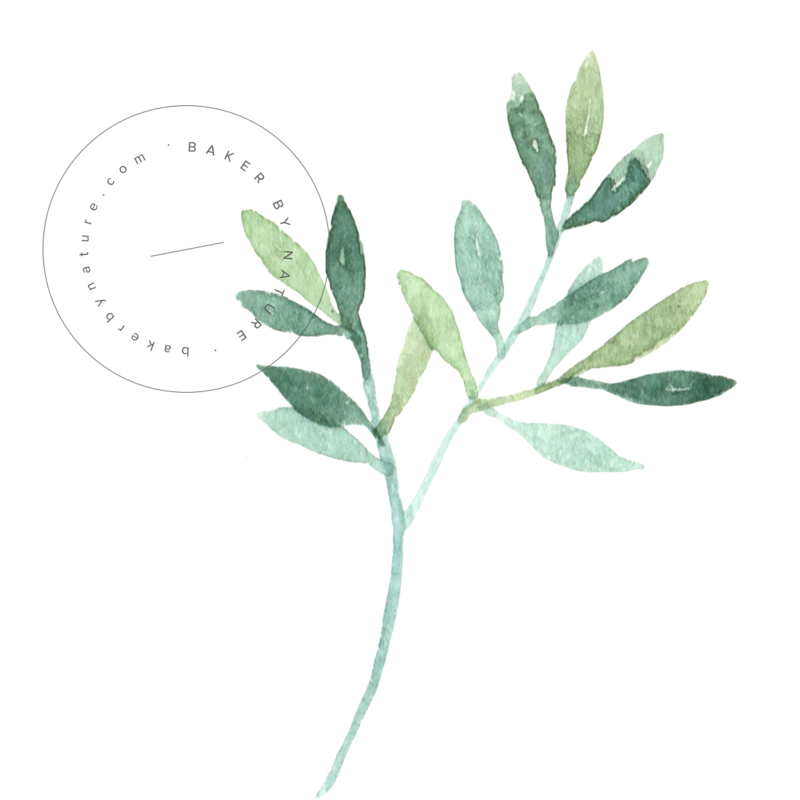 Line a large baking sheet with parchment paper or a non-stick baking mat; set aside. In a large bowl mix together 2 1/2 cups of the flour, salt, baking powder, baking soda, and sugar. In a small bowl, whisk together the egg and sour cream, then add to flour and butter mixture. In a small bowl combine remaining tablespoon of flour, grated zucchini, and a 1/2 cup of the cheese; toss to coat, then add to the scone mixture; gently fold them into dough with a spatula until combined. Pour the shaggy dough out onto a clean, floured work surface and shape the dough (you will have to work/knead it quite a bit to get it together) into an 8-inch circle. Cut the dough into 8 wedges and carefully transfer them to the prepared sheet. Sprinkle the top of each scone with a little of the remaining cheese. Scones are always best eaten the day of, but will keep, in an airtight container for 3 days. Scones may also be frozen for up to 2 months. Place them in a freezer safe bag and press all of the air out. When you're ready to reheat, preheat oven to 300 degrees, place the scones on a baking sheet, and bake until warmed through. omg this looks so divine! wow! xO! Oh those look amazing! Perfect anytime! Savory baking is probably my favorite. These with a nice pat of butter would be so yum! In the Instructions have Cinnamon and nutmeg but not in Ingredients if required what quantity of each? Super easy and tasty. I was thinking of adding thyme, jalapeño, and corn next round. Ooooh those additions sounds amazing, AJ! Very good way to use zucchini. I found I needed to add milk as the mixture was too dry. Also I found the sugar unpleasant in a savory scone. Going to try using some strawberries in place of the zuc. I have tried the zuc and it was great. I have an overabundance of strawberries now…I hope it works out. Omg these are spectacular! I was a little suspicious of the sugar but it really makes the flavor pop! We are these with some corn and kale soup I had canned last season, and it was a perfect quick weeknight meal. My 10-yr-old son has already insisted that I make these scones again. Thanks!!! These are soooo good! Next time I make them (and there will definitely be a next time) I might lessen the sugar and add some fresh herbs. I loved the tip to grate the butter. As someone who has struggled with pastry this is so helpful! Do you think I could swap out the sour cream with milk? How much should I use? Fantastic! I made them with small courgette and didn’t have to squeeze out the liquid as they don’t contain much. Also, I swapped the soured cream with 3 spoons of yoghurt and it was fine, they were delicious. Thank you for the recipe!